One of the best things for me about my friendship with Michelle is how differently we view things. Over the years we have both benefited from an expansion of vision, learning from each other how to see from a different perspective. We’ve learned to trust each other’s vision and follow along even when we don’t “get it” right away. Last week, I was utterly swamped, enmired in a project with a deadline I was having trouble meeting, so when Michelle offered to pick the story and present it, I was delighted. We’d agreed earlier that we wanted to work with a Native American tale and Trickster Coyote is an old favorite of ours. We created a workshop around him several years ago, using collage to do shadow work. Coyote loves to dance with the shadow and he proved a perfect mentor for those workshops. Still, when Michelle picked this blanket story it left me at a bit of a loss. It’s a teaching story, so it must be teaching something, but what? It seemed way too elaborate a set-up to say something so obvious. It wasn’t until I finished my collage that I realized what a big part landscape plays in this story. First of all Coyote’s antagonist is a rock! It’s one thing to see a biological creature as a character in a story but a talking stone that feels cold…? Then there’s that detailed description of all the places Coyote runs through with the rock chasing him – hills, thick forest, a river, prairie. As it happens the project I’d been working on was a talk and slide show about pilgrimage. It’s my contention that our human habit of going on pilgrimage is a direct result of the nomadic lifestyle practiced by all Homo sapiens for at least 40,000 years. I won’t repeat my reasoning here, suffice it to say my theory has to do with the importance of landmarks. In part this story seems to talk about the importance of maintaining and honoring an intimate relationship with one’s geography. The intimacy is underlined by the symbol of the blanket. In many Native American traditions blankets are strongly associated with the bonds of kinship. When publically given, a blanket acknowledges those ties to the whole community. 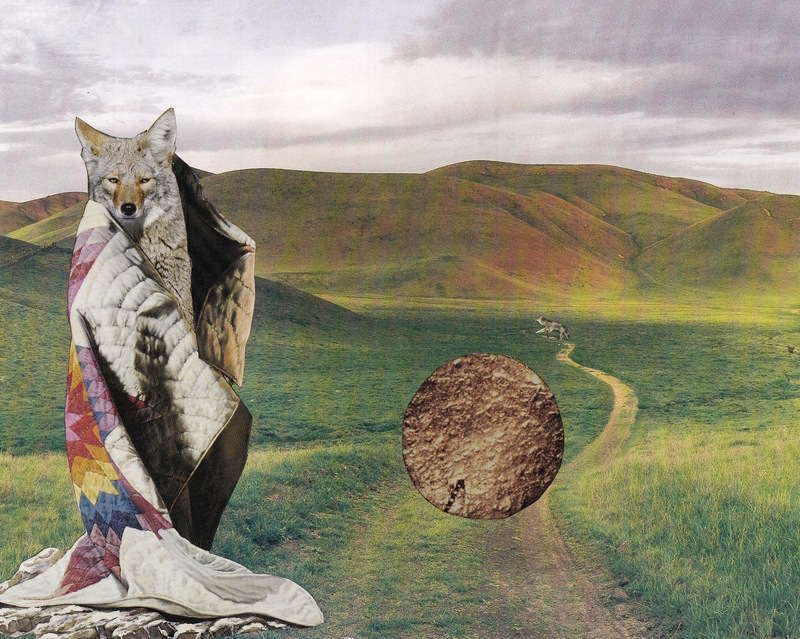 In this story we see Coyote giving the rock the blanket in front of Iktome. He makes a point of the gift, proclaiming the change of ownership in front of a witness. His failure to respect his relationship with the land (symbolized by the rock – think basics, bedrock, bones of Earth, foundation) has dire consequences from which he barely recovers; just as our failure to maintain a relationship with the land results in floods, landslides, and dust storms that flatten us.